who else should we target? I first drew this cartoon for a presentation at Google, and I’ve been getting enough requests from people to license it, I wanted to share it here. Many brands try to be all things to all people. 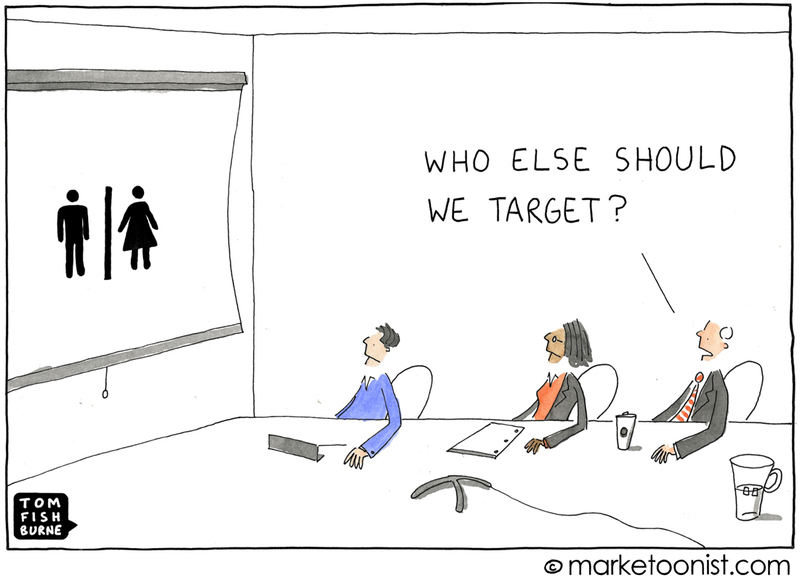 It can be tempting for marketers to try to target everyone, particularly if you want to reach scale. Yet brands that try to appeal to the vast majority won’t be that meaningful to any one group in particular. In the mid 90s, I worked in Prague for a year. This was a few years after the Wall came down, and an influx of Western brands with deep pockets were trying to crack the former Communist markets. With free competition, it seemed like the days were numbered for some of the local Czech brands. Once of those brands was Kofola, a soft drink invented in 1960 as an anti-Imperialist alternative to Coca-Cola and Pepsi. I’m back working in Prague for a couple weeks this summer, and I’ve been struck by how Kofola has not only survived, but thrived. Kofola is one of the few local brands in the world that has successfully defended against Coca-Cola and Pepsi (holding on to a 30-something share in Czech Republic, Slovakia, and Poland). From what I can tell, Kofola did this by not trying to out-Coke Coke. They seem to target a narrow audience of 20-something Czech pub-goers — a good fit given that Kofola is on tap at most local pubs. They also play up their local Czech and Communist heritage. This narrow focus allows them to run with an edgy insider marketing communication style very distinct from Coke and Pepsi. Here’s an example from one of their TV spots. I’d love to hear your thoughts on finding your target and thinking like a micro-brand. The most relevant connections (audience reach) are made when we figure out who would benefit from our services the most and then try to reach them in a way that isn’t annoying. 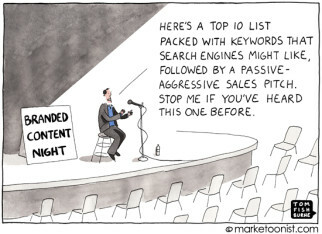 This one really spoke to me as we implement a new CMS especially with everyone clamoring for personalization features but have no plan or idea who they are targeting, let alone KPI’s for measuring success. Hi! Great to hear about local brands hanging on. Thums Up in the Indian market is the leading cola brand, and was acquired by Coca Cola with the intention of shutting it down. But given the market demand, they dropped that plan and revived it. Targeting everyone is a symptom of not wanting to invest in real market research. When you don’t want to invest much, any market will do. The challenge is when leaders believe they can reach some goal, any goal, without investing in this research. Instead of the gender split I also often see the ‘mono-mind-split’. In other words someone is either a functional decision maker or an emotional decision maker. And that of course always and for anything. Be it a bulk package of industrial tape or a nice glass of ice cold Kofola. I work on marketing products for small West Bank NGOs in Palestine. When it comes to micro-branding services and products to internationals, I’ve learned that it’s more important to have an authentic, honest voice given the complications in our region, and own up to limitations than it is to try to be either a snazzy start-up that copies what works in other “developing” countries that we are often lumped into by nonprofit enterprises and fair-trade entities. Back in February I was “liberated” from my marketing duties at an iconic American guitar manufacturer that tried to be all things to all people. The company had many issues in the marketing department but the biggest problem with the brain trust in charge of “coloring outside the lines” was that they used the same people that knew our brand and our demographic backwards and forwards to try to understand and create versions of instruments that catered to these target markets rather than bringing in someone from the demographic who lived the lifestyle with experience and success marketing to them. 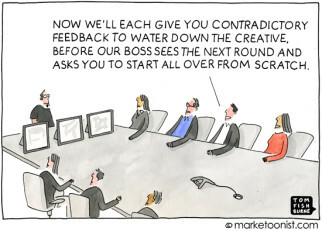 One size does not fit all applies to marketing too. When considering targeting, it’s certainly appropriate to start with “who would benefit from our services the most” but in some cases that can still be a pretty big audience. My favorite example (to make a point) is toilet paper (sorry for that visual on a Monday morning!) where everyone is a consumer whose benefits are effectively identical, but not all prospective *purchasers* are as important as others. It’s been interesting to me to find, however, that this can be a hard point for some brand marketers to appreciate — nobody wants to feel like they’re giving up on *any* potential customer. And of course I am not proposing that – just prioritization of the spend according to sales potential though this requires a disciplined, analytical look at that sales potential which is a process which might not be as well embraced as it should. And then a non-nervous, non-waffling commitment to carrying out the plan — long enough for it to matter. Just like a brand can’t be “all things to all people”, similarly it’s tough to compete effectively with everyone in the category all the time. In some categories you need to decide who you’re competing with and what you define as being “success.” For example, Kofola decided to “target a narrow audience of 20-something Czech pub-goers” – if that represents enough sales to satisfy the brand, then that’s great. If the long-term goal is to be as big as Coke, their “edgy insider marketing communication style” might eventually not be the ticket but that’s the point – the prioritization of segments depends on who you’re competing with and how best to differentiate in the minds of each segment *at a moment in time*. One might argue that an interesting way of brainstorming how to appeal to targeted segments within a larger audience is to think of yourself as being a micro-brand competing in a way that clearly distinguishes the brand from one major competitor. And the variations may include not only the type of consumers but also differing competitors, channels, etc. Not necessarily practical to run all those efforts, of course – need to mash it all up at the end to find the efficiencies but frees the mind to consider unique alternatives! Another excellent example of this is Chefette in Barbados who were one of the few brands worldwide to repel a McDonalds invasion. They did this by offering a wider range of products, well priced and good quality and by stressing the Bajan (Barbadian) -ness of it all. They also offer chicken however it’s interesting to note that the Colonel has a few branches around the island and these have survived. I agree that *one* reason for not truly committing to targeting is that “Targeting everyone is a symptom of not wanting to invest in real market research”. But I think that’s not a totally fair characterization of decision-making (and decision-makers) since there are other equally strong reasons — for example, not believing data once you have it (often compounded by a “brain trust” as Chris Boone points out who think they know better regardless…). But the biggest reason, I think, is that even when you have the right info, a reasonable targeting definition and strategy that leverages it, it takes courage to commit fully to it. There’s always nervousness about having picked the wrong direction and as soon as that CYA creeps into the thinking, great ideas become diluted. Cool that you used to work in Poland – and observed how big international brands are viewed over there. I say, “Good for the little Czech brand!” Micro-brands represent a preservation of local culture – and this neat little commercial also has an edgy, low-budget appeal to the younger set. Doesn’t matter how hard Coke and Pepsi try, they’ll still be the big American brands, and Kofola has it’s own Euro-hipness (kind of anti-establishment) that can’t be easily imitated by the big outside brands. Glad they are doing well! Now why isn’t there a successful Canadian cola? Guess we’re too focused on beer here! And with health trends, it probably isn’t the best time to launch one anyway! 🙂 Love your work, Tom. I’m now thinking of taking some cartooning classes because of you. One size fits all? Who wants to have the same perfume as your mum or dad? It may work for some categories but it needs some tweaks. I’m more interested to discuss the survival kits of local brands. It’s sad to see them down and take the rich local history with them. They should have survived given their deep understanding on the local consumers and cultures which is a huge advantage (that global brands find it hard to comprehend or follow). An example is Teh Botol from Indonesia, ready-to-drink tea. It’s always in the heart of Indonesian consumers wherever they go. Its communication style touches deeply and relevantly to the local culture. Coke follows the same path and it wins to some extent, but it’s still foreign. The key is ‘Be Local’, despite all global noise, our own culture is always our point of reference. I would love to hear more stories on the surviving local brands that we can learn from. I love the cartoons but I have to dissent from the thinking this time. The work of Andrew Ehrenberg in the late 50s, expanded by him and Barwise in the seminal “Repeat Buying”, and now developed by Byron Sharp and his colleagues has demonstrated repeatedly that targeting – and its evil twin segmentation – is one of the great marketing fallacies. It’s actually been hugely damaging to many brands.